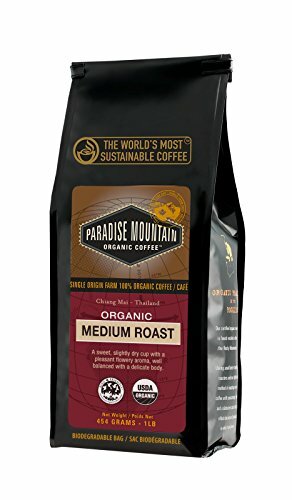 Paradise Mountain Organic Coffee is a bird friendly family of growers, roasters and coffee lovers from around the world who have partnered together to bring you the best high grown Arabica coffees from the mountainous regions of Chiang Mai, Thailand. As farm owners, we work in partnership with our growers, offering the education and tools needed to support the most sustainable methods of growing, harvesting and roasting. We are committed to providing the highest quality, awareness and ethical standards with every bag of our coffee. Using small batch traditional drum roasters and our high elevation method of roasting we ensure a coffee with consistency, freshness and a distinctive taste that truly reflects the piece of paradise in which it is grown. "We Promise you Will Taste the Difference"
No coffee matches our certifications, USDA certified organic, Smithsonian Bird Friendly (highest shade grown certification) Kosher certified, Direct trade, non-GMO. Our Thai coffees are not bitter or acidic like most coffees, we promise you will "Taste the Difference". We pioneered the art of "high elevation roasting". Coffee roasted at the same elevation it's grown has better taste & stays fresh longer. If you have any questions about this product by Paradise Mountain Organic Coffee, contact us by completing and submitting the form below. If you are looking for a specif part number, please include it with your message.